I Am Not A Superhuman – So Stop Saying It! Watching the Paralympics, people remark at how amazing athletes are - often for doing exactly what we deter disabled bodies from doing every day. In my last blog, I talked about Channel 4’s commercial for their Paralympics coverage: We’re The Superhumans. Prior to that, I have talked about what it is like to be a disabled person that can “pass” as non-disabled. Having now been involved in a number of events in conjunction with the Paralympics including performing in Graeae Theatre Company’s production of The Garden as part of the Cultural Olympiad in Rio, I have a few thoughts on this event and the concept of passing from my own blindy performer perspective. In these shows, I was working as an aerialist, something that always confuses people when they realize I’m disabled. 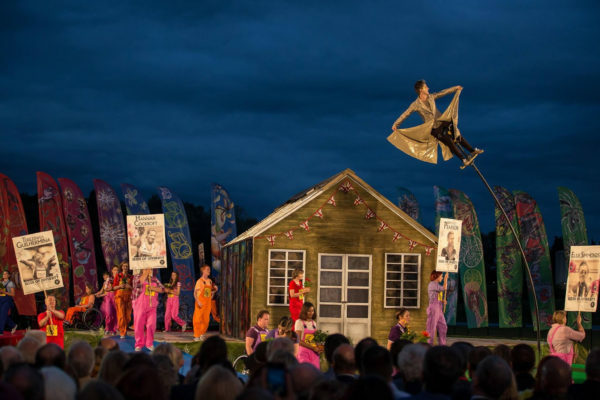 In the Heritage Flame Ceremony for Channel 4 and in The Garden I was working on a sway pole (a 5m tall fiberglass pole that the performer stands on top of to do big sweeping, swaying movements), and in my show for Liberty Festival I was on aerial silks. Every time I perform skills like this in front of people who are not familiar with the disability community, I am told that I “don’t look blind” and asked how I manage something that dangerous with a visual impairment. I think people think it should be harder for me, because the perception is that everything is harder for me. People don’t expect me to be able to dress myself, let alone climb five meters up a skinny pole or piece of fabric and perform physically challenging choreography. Alongside this, when people watch the Paralympics, there are remarks at how amazing these athletes are for the techniques they use to participate and excel in their sport. For example, how does someone with no arms do the backstroke? This is where the term Superhuman seems to come in, i.e. “look at this disabled body doing something it shouldn’t be capable of!” This concept is hugely problematic because it assumes disabled people strive to operate like our non-disabled peers, in spite of the fact that this will not happen, even when we excel at a skill. Here’s the thing. I feel safer five meters (or more) in the air standing on a bendy piece of fiberglass, or dangling from a silk/trapeze/harness than I do on the ground. Yes, aerial is risky, but with proper training it is a space that can be completely controlled by the aerialist. I am more aware of my surroundings on a silk than I am walking down the pavement near my flat. More to the point, I cannot think of any other environment in my life where I have been actively encouraged to be in control, take risks and push myself physically as well as creatively, to go fast, hang upside down, spin or maybe even fall. If I really think back, I can probably count on one hand, maybe two, the amount of times I was allowed to freely run as a child, to swing from monkey bars, or to play in any kind of “risky” way. To me, this active stifling of physical activity, play and most importantly, risk is one of the most damaging things society inflicts on blind (and otherwise disabled) people. It has absolutely nothing to do with vision and everything to do with control. It says a lot about who was in control of my body, my life and my supposed “safety” that I was not easily afforded simple joys like climbing a rope without unnecessary concern until I was 25 years old. I would imagine for any disabled athlete, they have a similar experience. Disabled people know how their body works, even as it works differently than a non-disabled one. Likewise, these athletes may be in more control in a pool, on a track, football pitch, etc. than they are in the rest of their life where society throws up far more barriers. I would also imagine that in sport and art, the minute disabled people are in control of a space, we start to look very capable, which many translate into passing or “not looking disabled”. This is also how being seen as “superhuman” can be damaging and is why so many disability activists have an issue with the word. Control and capability seems to equate to being the same as non-disabled. One’s own body is approached as a as though it is a barrier to be overcome, as opposed to an asset. Both of these ideas are extremely problematic. Instead of looking at me performing and thinking “she doesn’t look blind” or “isn’t that amazing that she can do that even though she can’t see!” it would be much more beneficial if people thought, “Ohhhh, that’s what blind looks like!” and to think about the benefits I have in an activity because of my disability. For example, I can’t see how high from the ground I am, which means fear of heights has never been a problem. This is a major asset for aerial. Blindness is not the Stevie Wonder rock of the head, touching faces or being followed down a high-school hallway by Lionel Richie. Disability is not incapability and it is not a burden. We have a body and we use it. It’s really that simple. I hope that as events like the Paralympics grow in popularity, and as disability arts seems to gain more of a stronghold in the UK and internationally, perceptions can shift so that stereotypes and stifling understandings of capability can be a thing of the past.